To buy a 3D printer at the best possible price, use our comparison tool to find a 3D printer that suits you. Filament deposit or SLA resin 3D printer, cheap, RepRap kit or professional, a wide range with free delivery. Don't forget to take a look at some 3D printer reviews and tests. Our 3D printing experts are available to answer your questions. Before and after purchasing online: technical support, customer service, our team is at your disposal to assist you in using your printer. To compare 3D printers, add them to the comparison tool for a full comparison of their accuracy, print volume and printable materials: perfect for finding the best 3D printer on the internet in our online store. 3D printers are becoming increasingly popular with the general public and industry professionals. How does a 3D printer work? It's simple! A 3D file is sent to the printer, which then deposits the material, layer by layer, until the 3D print is complete. These 3D machines are ideal for rapid prototyping using melted filament. Parts repair, modelling, engineering and industrial applications for high-precision professional 3D printers using a fine layer of thickness for more precise details. Second-hand models are sometimes up for grabs, with used 3D printers available for purchase in our newsletter. Make sure you subscribe so you don't miss out. Trust the number 1 for 3D printing in France. 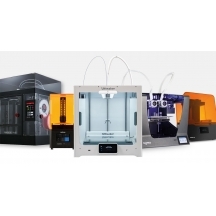 Makershop3D will advise and guide you in choosing your 3D printer. When buying a 3D printer, trust our technical team to direct you to the best in 3D. Makershop3D helps companies and individuals to buy 3D printing material for their equipment, training and related services. The Ultimaker 2 Extended+ is a high-volume printing machine for printing objects up to 223 x 223 x 305 mm (length, width, height). Connected via an SD card, this versatile and self-contained 3D printer can print large-format quality prototypes. 2 995,00 € Tax incl. The Ultimaker 2+ is the fastest and most accurate 3D printer on the market. There's no need for any special technical knowledge to start printing in 3D, using what is undoubtedly the best 3D printer on the market in terms of performance. 4 434,00 € Tax incl. 3 594,00 € Tax incl. Ultimaker Original is a self-assembly kit available in two versions. This 3D printer is the first born of the Ultimakers and has features worthy of the best 3D printers. The FlashForge Creator Pro 3D printer is the new generation 3D printer from FlashForge. This double extrusion 3D printer is the next generation of the FlashForge Creator. The Witbox 2 is a completely safe 3D printer to introduce youngsters to 3D printing. It’s ideal for a family or school environment and very easy to use. The Witbox 2 is a "Plug and Play" printer that’s immediately ready for use. 1 678,80 € Tax incl.